Wavell Avenue, bred in Ontario by Eugene Melnyk; Woodbine’s leading trainer Mark Casse; and J. Paul Reddam’s Nyquist were among the winners in Saturday’s lucrative Breeders’ Cup card at Keeneland Racecourse, in Lexington, Kentucky. Wavell Avenue, a four-year-old daughter of Harlington out of the Silver Deputy mare Lucas Street, upset the Grade 1 $1-million Filly and Mare Sprint at odds of 10-1 with a furious rally, travelling from 11th position in a field of 14, to reel in the pacesetting La Verdad for a 1 ¾-length score in the seven furlong event. Wavell Avenue stopped the clock in 1:22.39. Trained by Chad Brown, the victory marked the fourth win of the season for the dark bay and provided her first stakes score on the world’s biggest stage. Canadian-bred Judy the Beauty, defending champion of the Filly and Mare Sprint, finished fifth. Casse enjoyed an incredible start to the lucrative weekend of racing, which kicked off on Friday afternoon, winning his first ever Breeders’ Cup event when Catch a Glimpse captured the Grade 1 $1-million Juvenile Fillies Turf. A seven-time Sovereign Award winner as Canada’s outstanding trainer, Casse also sent out Airoforce (2nd) and Conquest Daddyo (4th) for a strong showing in the Juvenile Turf. On Saturday, Casse saddled Robert E. Masterson’s Tepin in the Breeders’ Cup Mile and the four-year-old Bernstein filly, bred in Kentucky by Machmer Hall, flew to a two-length victory joining a trio of legendary females who have accomplished winning the turf Mile, including Goldikova (2008-2010), Miesque (1988-89) and Royal Heroine (1984) since the race’s inaugural running in 1984. Irish-bred Mondialiste, who captured the Ricoh Woodbine Mile in September, rallied impressively for second-money in the Mile, 1 ½-lengths in front of Kentucky-bred Grand Arch who is based at Woodbine with trainer Brian Lynch. Nyquist, trained by Doug O’Neill, remained undefeated through five starts with a ½-length score in the Grade 1 $2-million Breeders’ Cup Juvenile for owner Reddam Racing LLC, nom de course of Windsor, Ontario native John Paul Reddam. Sent to post at odds of 9-2, Nyquist settled in mid-pack in the early running of the 1 1/16-miles tilt under jockey Mario Gutierrez before taking command at the top of the lane with plenty in reserve to fend off the advancing Swipe. Riker, trained by Woodbine-based Nick Gonzalez for Tucci Stables, set the pace in the Juvenile under jockey Jesse Campbell staying on for sixth. The Casse-conditioned duo of Conquest Big E and Siding Spring finished eighth and 10th respectively. Reddam also sent out Ralis for a 14th-place finish in the marquee event for two-year-olds. 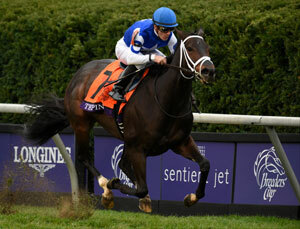 In addition, the Reddam-owned Land Over Sea finished seventh in the Grade 1 $2-million Juvenile Fillies. The featured $5-million Breeders’ Cup Classic was won by U.S. Triple Crown champion American Pharoah in a runaway track record performance under jockey Victor Espinoza. Additional Canadian-connected results on the card include top sprinter Private Zone, bred in Ontario by Adena Springs, who finished second to Runhappy in the $1.5-million Sprint. A trio of starters in the Grade 1 $1-million Turf Sprint included Stacked Deck (10th, trained by Woodbine-based Barb Minshall), Something Extra (13th, trained and co-owned by Woodbine-based Gail Cox) and Jimmy Bouncer (14th, owned by Reddam). Live thoroughbred racing resumes Sunday at Woodbine with a 10-race card including the featured $250,000 Princess Elizabeth Stakes. First post time is 1 p.m.